A few quick resources to look at the state of the interwebs and to help you measure your own state of being. First, check out what's hot in the blogosphere. 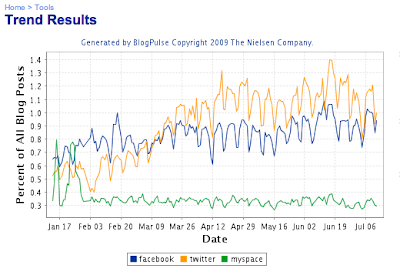 Nielsen data shows that Twitter is gaining mentions and MySpace is flatlining. Second trend, Nielsen Global Online Consumer Survey shows that personal recommendations and online opinions are the most influential. Government is not listed in the mix, but depending on how you cut it, government sites are most like "brand" websites, which have a respectable 70% positive trust level. The important piece for government, though, is to make content more sharable. 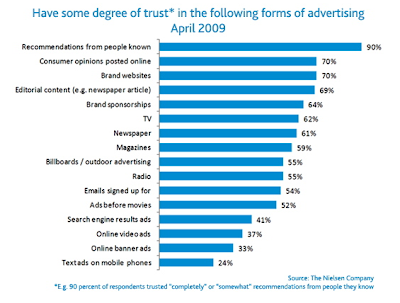 If a friend sends an email, or shares a page on Facebook or tweets a link, 90% of the people will trust the information. Helping people to share government content looks like a big win. Looking closer at what this means, only 9% of the Twitter users meet all three criteria (less than 10 in each category). For example the State Department travel alerts follows only 15 but is followed by 6,215 and have updated with 175 alerts. And then there's Oprah, with her nearly 2 million followers, who only follows 14 people with a paltry 50 tweets. People who have never tweeted may be using Twitter as a news aggregator, taking in information and choosing to share nothing. They are still involved by reading messages and are available. The people with few followers may follow many, follow a few people with whom they have a close exchange, or perhaps simply never got the Twitter bug. You can read the entire State of the Twittersphere (download PDF) report, here.